Unseen Things: Exploration has arrived! Book 3 in the Unseen Things series is now available! You can get it here on the official website in epub, Kindle (mobi) and PDF formats by clicking Buy the Books! in the menu at the top, or you can get it from Smashwords or Amazon. Once Smashwords ships it out for premium distribution, it’ll go out to the other usual retailers as well. 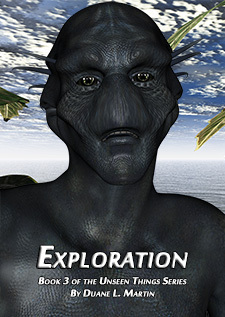 I’ve updated the Characters, Trivia and Series pages all with new info about Exploration. The series is now available for purchase on the official site! I have now made the Unseen Things series available for purchase directly here at the official website. It’s still available at the other online retailers as well. Unlike the other online retailers, when you buy direct through the website, you’ll receive download links for the Epub, Kindle (mobi) and PDF versions of the books rather than just one specific format as you would on the other sites. Just click the Buy the Books! nav link at the top of the page.